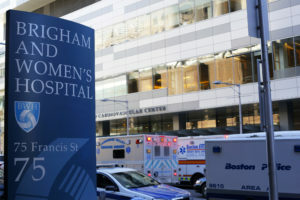 The incident command system kicked in at Brigham and Women’s Hospital about a week ago. A large team of doctors, pharmacists, and nurses began assembling every morning to confront an emerging crisis with the potential to severely undermine care for patients. The challenge was different than it was during the Boston Marathon bombing, another event that triggered the command response. This one wasn’t rushing toward caregivers as fast. But it was similarly daunting and logistically demanding: Amid a nationwide crisis caused by too-easy access to medical painkillers, hospitals are now struggling to find enough of that same class of drugs to keep their patients’ pain controlled. That is the reality now facing Brigham and Women’s and other medical providers across the country. Production of injectable opioids has nearly ground to a halt due to manufacturing problems, creating a shortage of staple medications used to treat a wide array of patients. Alarms are now ringing at all kinds of medical providers, from sprawling academic hospitals to small hospice programs, and many are launching efforts to conserve injectable opioids and institute safeguards to prevent dosing errors that can result from rapid changes in medication regimens. These products, packaged in vials, patches, and syringes, are distinct from the prescription pills at the root of the nation’s opioid addiction crisis. They are distributed to hospitals and other medical providers that use them to treat patients undergoing major surgeries or those who are suffering from intense pain related to trauma or cancer. The severity of the shortage, which has been brewing since last summer, only became clear in recent weeks after Pfizer Inc., the dominant manufacturer of injectable opioids, began notifying customers that it has halted production of some medicines and will not be able to fully restore its capacity until the first quarter of 2019. Some hospice providers in Florida, Maryland, and Hawaii are already reporting they have run out of some opioid products and are struggling to replenish supplies needed to help patients, according to the National Hospice and Palliative Care Organization. Pfizer has attributed the shortage to a problem with a third-party manufacturer that produces the pre-filled syringes that contain various formulations of opioids, including morphine, hydromorphone, and fentanyl. Scott Knoer, chief of pharmacy at the Cleveland Clinic, said the hospital system is carefully monitoring inventory and using alternative treatments whenever possible. That might include giving patients oral opioid medicines, or using IV Tylenol when their pain can be managed with a less potent drug. But the price of IV Tylenol has also tripled since 2014, to $37 per vial compared to $2 per vial for IV morphine. That carries a significant budget impact, in addition to extra costs for staff members to work overtime to manage the opioid shortage and receive additional training. Pharmacy leaders at Brigham and Women’s hospital expressed a similar weariness, noting that regulators have made limited headway in addressing shortages over the past decade. In their incident command meetings, they discuss the volume of opioids available on a given day and how it might be impacted by the daily demands of surgery, emergency care, and other treatments. So far, the shortage is not so severe that the hospital must scale back on services or consider rationing medicines. But its physicians, pharmacists, and administrators are also emphasizing the use of alternative pain medications and strategies to help conserve injectable opioids over the next year. The effort also involves regularly reaching out to wholesalers to make sure the hospital claims whatever additional supply becomes available. Although the shortage was not directly caused by the opioid addiction crisis, the response to it is being impaired by some of the legal controls surrounding these drugs. In order to increase the supply of injectable opioids, the Drug Enforcement Administration, which regulates the distribution of controlled substances, must lift quotas on smaller manufacturers to allow them to make more. But despite requests from these manufacturers and a wide array of hospital and patient groups, the DEA has not yet granted enough extra capacity to resolve the shortage. READ NEXT: Pressure builds on the DEA to stem the supply of prescription drugs, but at what cost? Earlier this week, a group of U.S. senators filed legislation that would make it easier for the DEA to adjust its production quotas and respond to emerging problems. Though the bill focuses on helping the DEA to address the oversupply of opioids that contributed to the addiction crisis, it may also enable it to respond more swiftly to shortages. But even if the legislation passes soon, it is unclear how quickly the DEA will act and whether smaller manufacturers of injectable opioids can ramp up production fast enough to alleviate the shortage. The problem is compounded by limited competition and the lack of redundant manufacturing capacity. Some medical organizations have pushed for regulatory or legislative solutions to help provide a more reliable supply of medicines. “After this last round of shortages, I think it’s become pretty apparent there is still some work that needs to be done,” said Jillanne Schulte, director of regulatory affairs for the American Society of Health-System Pharmacists. The organization has pushed for changes to make reporting of shortages more timely and transparent, and ensure backup manufacturing capabilities are available for certain crucial medicines. “If you don’t have enough manufacturing capacity going, and something goes offline, you may be in a very uncomfortable position very quickly,” Schulte said. But manufacturers say the issue is difficult to solve from a financial standpoint. Most operate with lean capacity because of tight profit margins on generic medications. Injectable opioids, while used in large volumes, cost only a few dollars a vial, so maintaining extra manufacturing capability doesn’t pencil out. Motto said West-Ward will need to add more staff and facility space in order to increase production if the DEA does eventually allow it to produce more injectable opioids. This article is reproduced with permission from STAT. It was first published on March 15, 2018. Find the original story here.